How to use Stroke & Coats. Apply one coat for a watercolor look, two coats for a semi-opaque look and three coats for a totally opaque finish. You get great coverage, even when applying light colors over dark colors. Stroke & Coat® does not run or bleed, regardless of how it is applied. Colors can be layered or butted up against other colors. Use for precise design work or layered with other glazes for majolica projects. Not the conventional user? Thin it with water and spray apply with a spray bottle. Or create a dimensional look by using in a detailer bottle. Other techniques that can be used with Stroke & Coat® include marbleizing, spattering and sponging, anything your heart desires. Cone 06 to cone 6 and beyond! Mayco's Stroke & Coat® Wonderglaze is one of today's leading glaze lines used by Teachers, potters, and the ceramic artists. This one color line is so versatile with a zillion uses and techniques, as well as a beautiful fired finish. - All colors are intermixable, which allows for the creation of a wider color palette. - Colors, in their liquid state, are true to their fired color finish. True color out of the jar helps make choosing colors for design work easier. - Apply smooth even coats for solid coverage. Dimensional or embossed (raised) effects can be achieved with heavy, layered applications. - Stroke & Coat® fires to a gloss finish and does not require a clear glaze to achieve a high gloss finish if uniformly applied. - Can be applied to wet clay or bisque fired ware. - All colors are luster compatible. - Firing range of 06 to cone 6. - Speckled Stroke & Coat® performs in the same manner and has the same characteristics as the opaque Stroke & Coat® line. Clear Glaze is not needed to achieve a glossy finish. 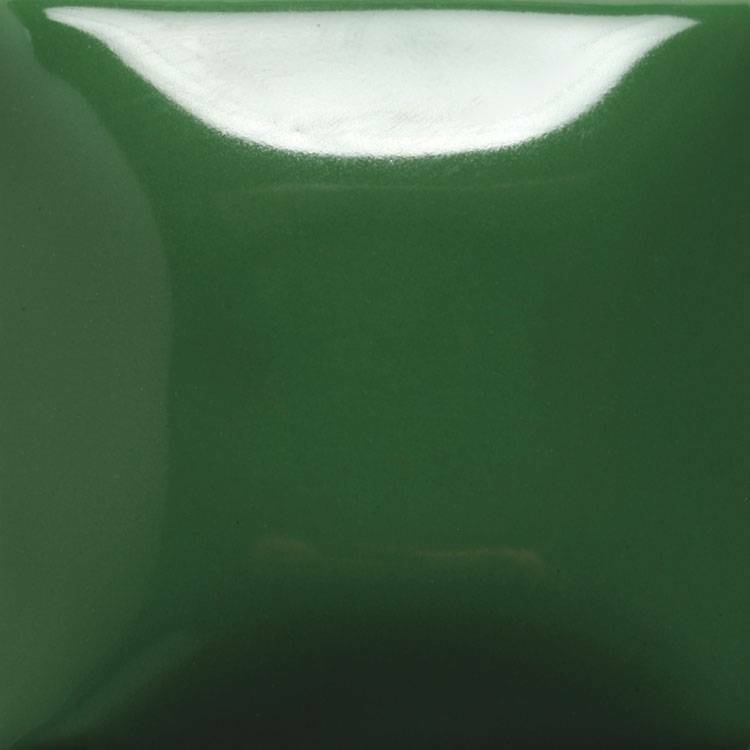 Stroke & Coat®, because of their formulation, fire glossy and do not require a clear glaze application. But, if desired, they are compatible with a clear glaze in one firing. Stroke & Coats are not just for Bisque. There's no need to buy a separate glaze for each clay body you work with. Apply Stroke & Coat® to greenware, bisque, earthenware or stoneware. Stroke and Coat's unique composition will fit high expansion talc bodies to low expansion stonewares...all without crazing or shivering. When applying Stroke & Coat® to greenware, do not glaze an area of the ware such as the bottom or back to allow gases to escape during the firing process. Eliminate a firing by doing it this way. Get your project done just a little bit faster and have more time create new projects. Firing Ranges from Cone 06 to cone 6. While the majority of glazes are designed to mature at shelf cone 06, most of the Stroke & Coat® colors perform well up to cones 9 & 10. Unlike some glazes where over firing by one or two cone difference means having washed out color, Stroke & Coat® maintains its color, vibrancy & quality surface. All colors are luster compatible. Stroke & Coat® also works for Raku, a low-fire form of pottery where the pots are removed from the kiln as soon as the glaze has melted and then left to cool or doused with water. All Stroke & Coat® colors can be fired at the same time without any color changes. Most Stroke & Coat® colors can be fired multiple times and still hold their bright colors. Use them with other products for a truly exceptional look. Stroke & Coat® can be mixed with other non-toxic glazes to create a piece that shows off your unique style. Apply over any non-moving glaze or underglaze surface. When thinned and applied on top of a Series 2000 Matte surface in a brushstroke design or watercolor technique, Stroke & Coat® takes on the underlying matte characteristic of the glaze. Stroke & Coat® also looks great when used in combination with Crystalites, Jungle Gems NT, Foundations, Classic Crackles, Elements and much more. Do you sometimes have leftover color on a palette that is not going to be used? Don't scrape it back in the bottle. That can cause contamination and ruin your original color. Let the left over color dry out, scrape the dry color into a communal container of some kind like a bowl or jar. When you have enough saved, you can sprinkle onto wet glaze, so that it will stick, and fire. You will have bright vibrant color spots to the area you sprinkled it on. Our web page has an educators section that has a multitude of lesson plans that can be scaffolded to meet any classroom needs. The educators section is easy to navigate and a great reference library for ideas using our Stroke & Coat® line. Reds: Looking for a fool proof- no fail red? Try Hot Tamale, Candy Apple Red and our brand new red- Ruby Slippers. You'll be seeing red - in a good way.